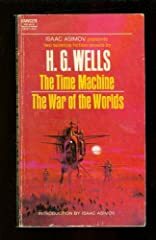 The Time Machine and The War of the Worlds (Borders Classics). 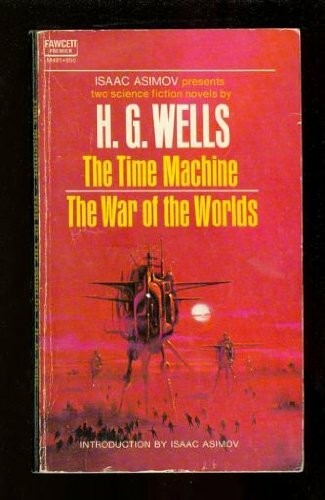 The Time Machine, Wells' first novel (published in 1895) and The War Of The Worlds (1898), comprise two great firsts in the history of science fiction. Respectively, they were the first novels to center around time travel and the first to suggest intelligent extraterrestrial life and interplanetary invasion. The Time Machine When the Time Traveler boldly stepped out of his machine for the first time, he found himself in the far future and in an almost unrecognizable world. In another, more utopian age, creatures seemed to live together free of strife and competition. The Time Traveler thought he could learn the secrets of these happy beings and take the lessons of life to his own time - until he discovered that his marvelous invention, his only means of escape, had been stolen. The War of the Worlds "No one would have believed in the last years of the nineteenth century that this world was being watched keenly and closely by intelligences greater than man's and yet as mortal as his own. . ." So begins The War of the Worlds, the novel that made Wells famous and has enthralled and terrified for almost 100 years. Ten huge and tireless creatures land in England and, using their deadly rays and crushing strength, threaten the very existence of humankind. Wells' classic is not just groundbreaking science fiction, it is a shocking social parable about man's inhumanity to man.